Hi friends! Today I have some pretty awesome news for my fellow runners. 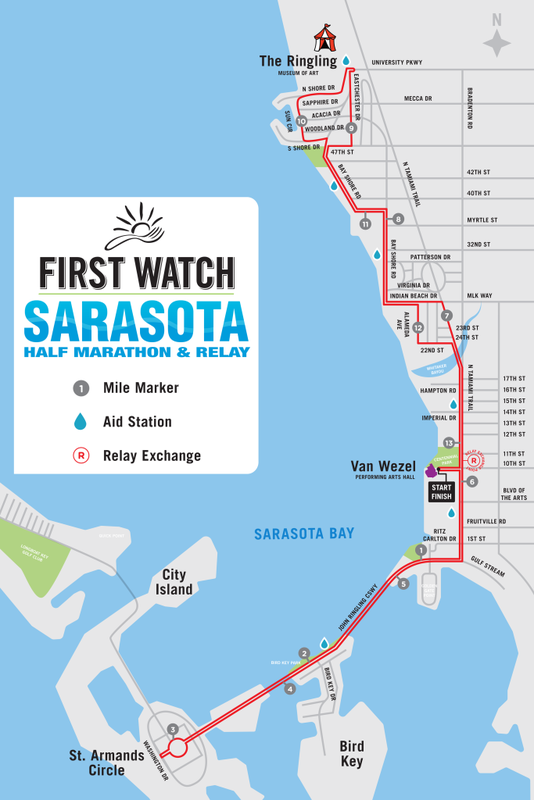 For the third time, I am partnering up with First Watch Sarasota Half Marathon which is taking place on March 19, 2017! We have some fantastic memories at this event and I am giving a few people a chance to run this race for free! I cannot say enough about the First Watch Sarasota Half Marathon. It's sponsored by First Watch, a restaurant where everything is made fresh to order and has some surprisingly healthy options. 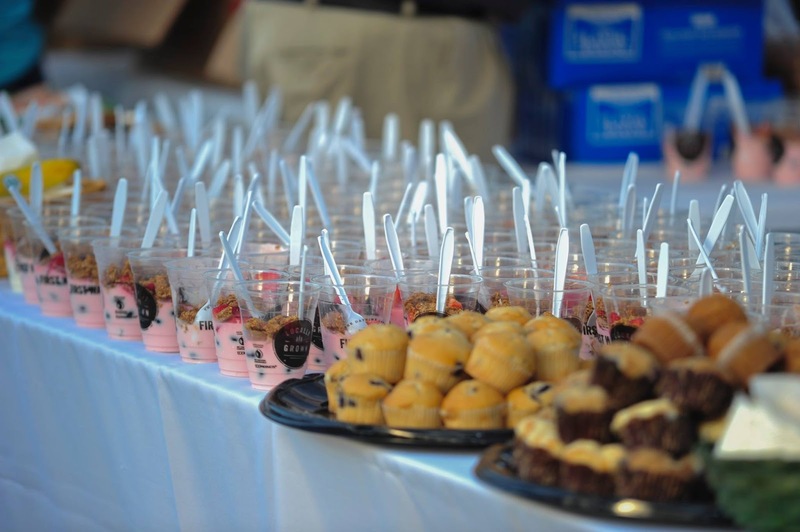 All First Watch Sarasota Half Marathon participants receive a gourmet breakfast at the finish line and if you feel inclined, a free Michelob Ultra (I am definitely one of those inclined people). The course is amazing, starting at Van Wezel Performing Arts Hall, then over the John Ringling Bridge to St. Armand’s Circle. You make a loop and go back over the bridge. At this point, those doing the relay will find the exchange at 6.2 miles and the second half will continue the race with those running 13.1. 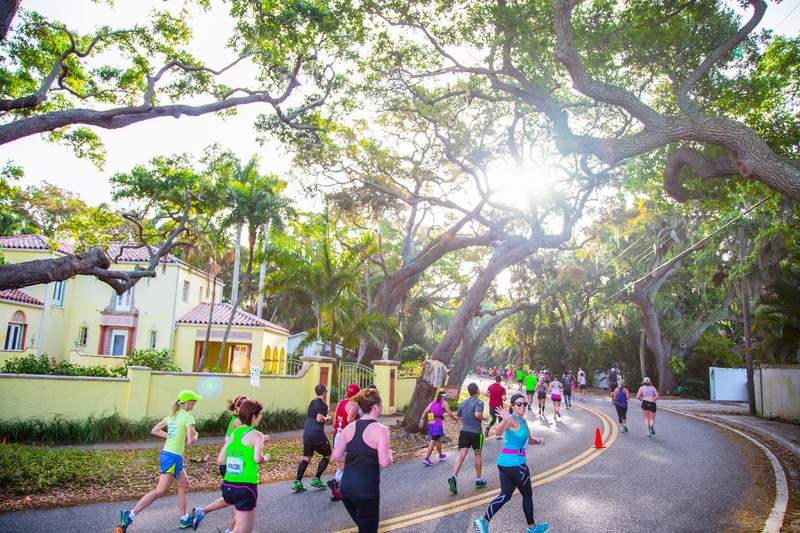 The second half of the race continues on Tamiami Trail, then onto residential Indian Beach Drive, heading over to the John Ringling Museum, then looping back to finish at Van Wezel Performing Arts Hall. The finishers medals are huge and along with delicious food, you will find live entertainment at the finish. 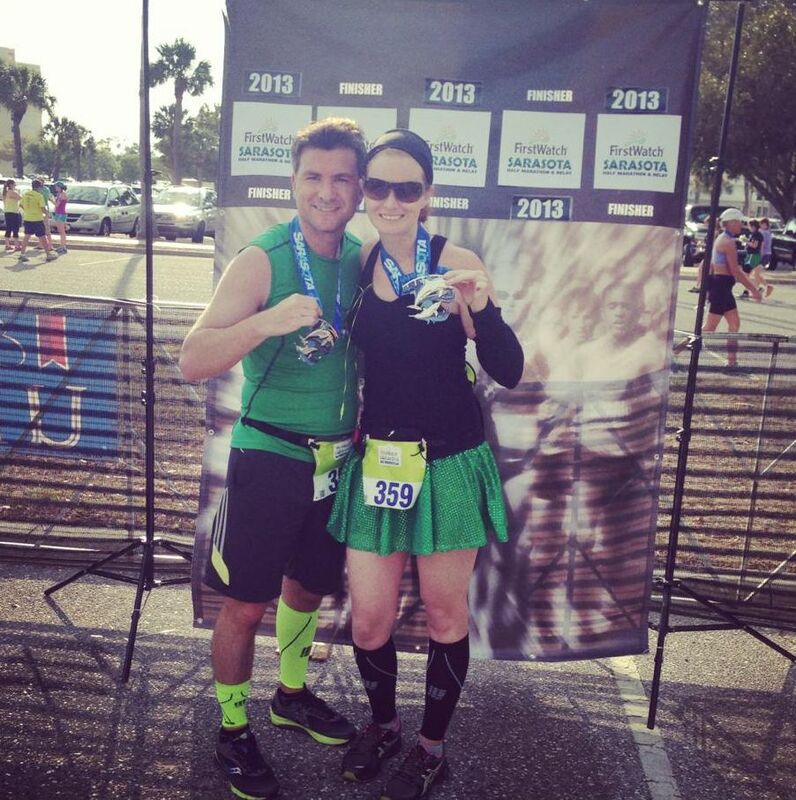 2013 was our first time participating in the First Watch Sarasota Half Marathon series and we did the relay. Looking back on the race recap makes me smile (and laugh at the horrid iPhone photo quality)! At the time, my husband and I were not engaged yet and very into running. I reread the post and my statement of "I was jealous of everyone running the full vs. the relay" made me LOL. 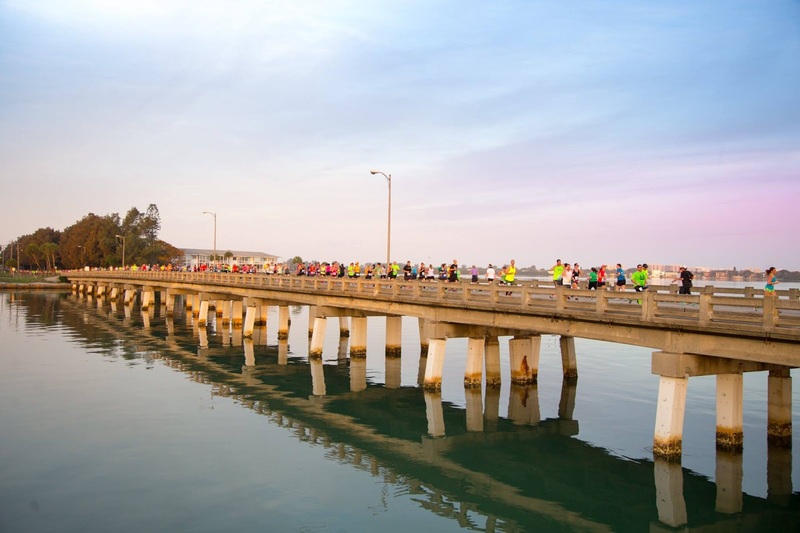 Read about our 2013 First Watch Sarasota Half Marathon Relay Recap here. We returned in 2014 and I clearly remember this race. It was shortly after I went race crazy, running 10 races in 3 months, 2 were full marathons, 4 were half marathons, including one Dopey Challenge and one Glass Slipper Challenge. The 2014 relay began with me doing the first 6.2 miles - and I struggled hard. We finished slower than anticipated but that was fine with us. We enjoyed the course and the amazing sunrise. 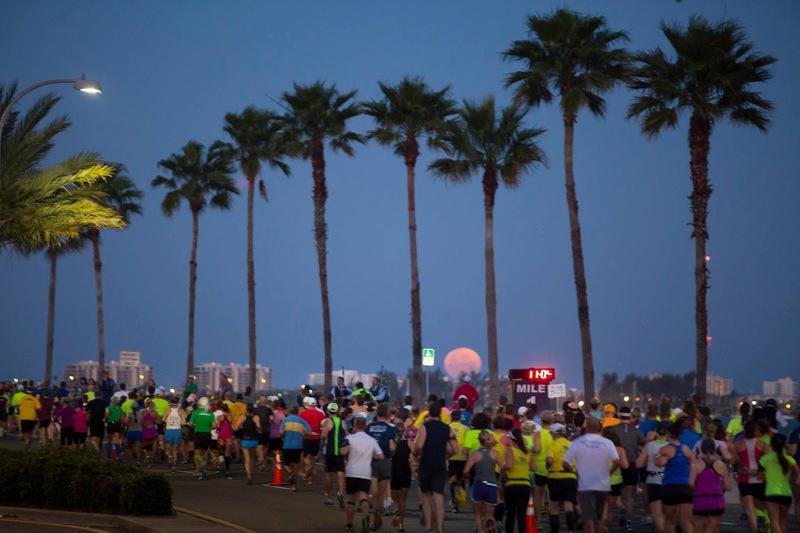 Read about our 2014 First Watch Sarasota Half Marathon Relay Recap here. This was the last race we ran before our wedding! Although I am 4 years older than the first time we did the First Watch Sarasota Half Marathon Relay in 2013, I feel much stronger. I've never been one to write about hopes of a PR but I cannot lie that there is a huge part of me that want's to slay this course. I have not one, but two race entries to giveaway today! I am giving one away here on the blog and one away on Instagram (click here to head over to that post from your smart phone). This race is selling out fast so this will be a quick giveaway, ending a week from today. I encourage you to share away on twitter daily through the rafflecopter below to gain extra daily entries. One of my favorite races! I'd love to return! Had the best time 2 years ago when my son was my relay partner.